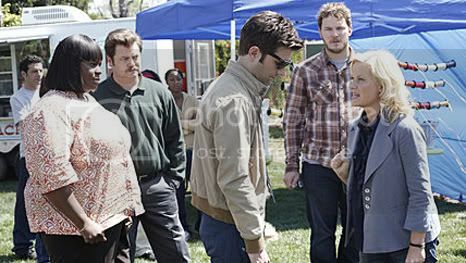 Posted on Sunday, June 6, 2010, by Eric - TV Geek Army "Revered Leader"
Quick Take: Parks and Recreation, "Freddy Spaghetti"
Review: Parks and Recreation, "Freddy Spaghetti"
(S0224) So many great showcases and moments in Park and Rec's season finale. Let's start with Amy Poehler as Leslie Knope, someone almost easy to overlook because of the amazing ensemble cast around her and because Poehler plays something of a good natured, daffy-yet-high achieving straight woman against a menagerie of zaniness. It should be noted too that her character sets up storylines so well because of her determination in the face of larger forces – the all night telethon in "Telethon" and campaign to put Freddy Spaghetti on stage for the kids during a government shutdown come quickly to mind. "Freddy Spaghetti," like last week's "The Master Plan," had to serve two masters at once. It closed out this triumphant second season of "Parks and Rec" and brought either closure or major new developments to the stories of the season: Mark becomes Brendana-quits, Andy and April take one step forward and two steps back, Tom basks in a new relationship and then gets sucker punched by seeing Ron wearing his post-coital Tiger Woods outfit with Tom's ex-wife. But with the introduction of Chris and Ben and the budget crisis storyline (and even the start of the Tom/Lucy coupling), these last two episodes have felt very much like the start of season three. While Mark (Paul Schneider) was not my favorite character by a long shot, he left the show on a high note, character- and story-wise, by maintaining his determined sense of laid back competence in getting dumped by Ann (Rashida Jones) and saying goodbye to Leslie and Pawnee. Really, things are now wide open for hilarity and antics with in the Andy-April-Ann love triangle, which has had a great slow build over the course of the season. The addition too of Rob Lowe and Adam Scott (a firepower of a duo joining the cast, at least for a spell) poses multiple love interest permutations, throwing Leslie into the mix. If I had to guess, the stars seem aligned for Leslie and Adam Scott's Ben, Ann and Rob Lowe's Chris, and Andy and April to get together. But of course the fun will be in how we get from here to there. 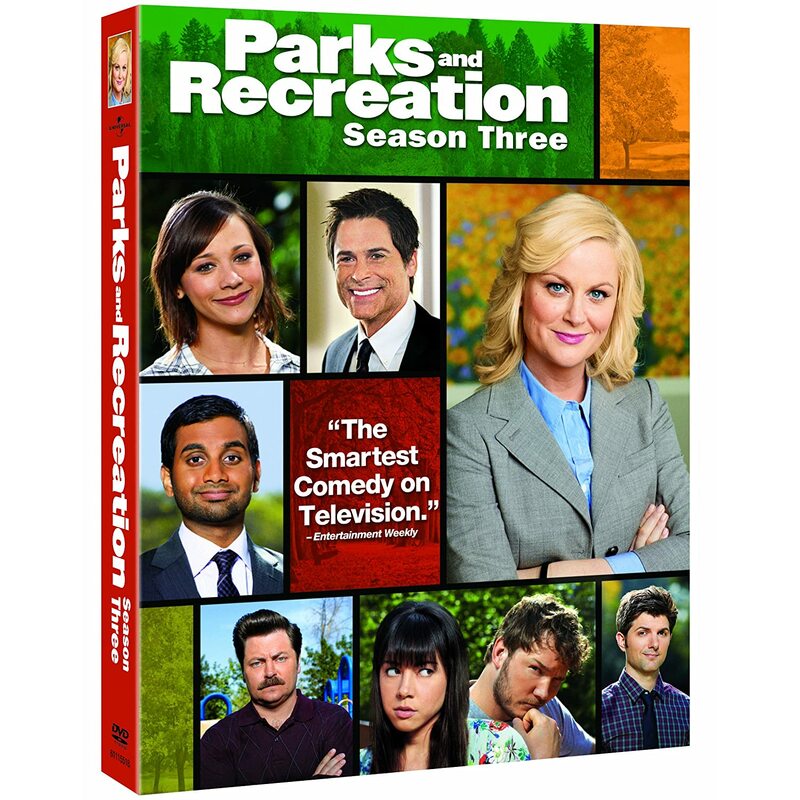 Parks and Recreation ends its second season on the highest of high notes, arguably the best comedy on television currently (I'll throw Community, Modern Family, and Party Down, fronted by Adam Scott himself, into the running for kicks). I like to think the opening shots of an empty Parks and Recreation department due to the government shutdown with no backing soundtrack are akin to The Wire's shots of Baltimore city scenes. "If the government's shut down, how are we gonna stop Al Qaeda"? Video: Parks and Recreation, "Freddy Spaghetti"
Recap: Parks and Recreation, "Freddy Spaghetti"
When Ben, the state auditor, prevents Leslie from holding a children's concert, she takes matters into her own hands. Mark makes some big decisions about his life, and Andy gets some unexpected romantic attention. From Around the Web: Parks and Recreation, "Freddy Spaghetti"
TV Squad: In Mark's place, we have both Rob Lowe and Adam Scott, potential love interests for both Anne and Leslie. I'm not sure how I feel about Lowe's character -- they haven't given him much depth yet, but I'm loving Scott. His bruised idealism is a nice match for Leslie's blind idealism. IGN: BrandaQuits' farewell was thankfully short and sweet in an episode that was full of infectious giggles and Leslie Knope-affirmation. A.V. Club: While Community has reached dizzying heights of greatness in only one season, P&R has transformed itself in its second year from a shaky enterprise to a remarkably consistent and reliably funny situation comedy with a great deal of heart and probably the best cast on television.